This week, the Nass meditates on orange, gets accustomed to single living, and sends some letters out into the ether. This week, the Nass says goodbye to summer, travels to the far ends of the Earth, and takes the morning shift. In a special issue of the Nass, we get a glimpse into a corner of campus that often goes unseen and hear the stories of students who struggle with eating disorders. This week, the Nass writes from Paris, watches silent films, and welcomes Spring with some acai bowls. The Nass on Mel Gibson, Princeton’s most on-brand brand, and the sweet sound of chiming chromatic bells. 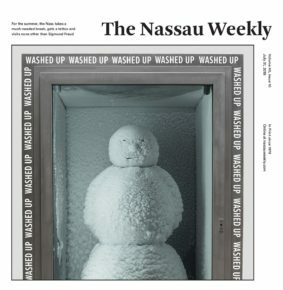 This week, the Nass moralizes COS, combats climate change, and visits the Isle of Dogs. This week, the Nass does face masks in Frist, visits the Holden collection, and gets itself into a long-term relationship. This week, the Nass makes some playlists, organizes PERIODPALOOZA, and re-lives its childhood. This week, the Nass unpacks God’s Plan, reports on the lives of undocumented immigrants in New Jersey, and goes home for intersession. This week, the Nass visits the modern side of paradise, resists eating tide pods, and plants its roots just by Fitzrandolph Gates.